How do I limit the number of successful checkouts that can occur on a payment form? 3) Click in the Successful Checkout Limit section and type in the total number of successful checkouts that you would like to allow on the payment form. 4) Click the Save & Finish or the Save button. 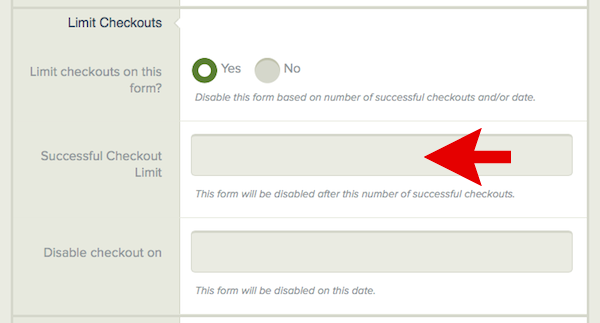 5) Your form will be disabled after it has reached the number of successful checkouts you set. Payers will not be able to check out on the form after that number has been reached. You can always return and re-enable the form by raising the number of potential successful checkouts.